England World Cup odds have taken a tumble following victory over Colombia in last night’s penalty shoot-out. Remarkably, Ladbrokes now have Gareth Southgate’s side as second favourites to lift the trophy this summer, moving them ahead of France and with only five-time winners Brazil ahead of them. England will take on Sweden in the quarter-finals in what looks on paper at least to be a favourable draw for the Three Lions in their bid to win the cup for the first time since all the way back in 1966. Here’s a look at the latest England World Cup odds as they’re now rated at 7/2 to claim the biggest prize in the game, having been 4/1 before the win over Colombia. 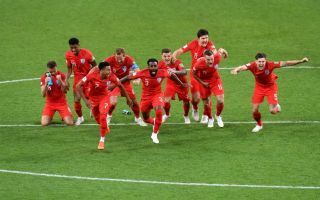 England’s win last night was their first ever on penalties at a World Cup – a highly encouraging omen as Southgate looks to have created a new sense of togetherness and belief in this squad.